Subject: Antique print, titled: 'Schadliche Aderflugler, tenthredo.' 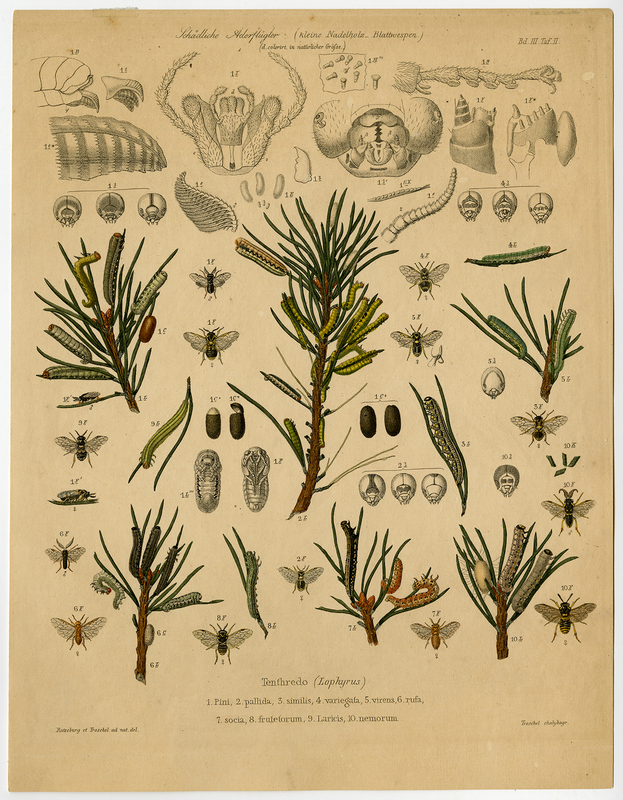 - This print shows harmful moths, ichneumon and tenthredo in pine. Condition: Very good, given age. General age-related toning and/or occasional minor defects from handling. Please study scan carefully. Medium: Etching / engraving on wove paper. Size (in cm): The overall size is ca. 20.8 x 27 cm. The image size is ca. 19.4 x 24.5 cm. Size (in inch): The overall size is ca. 8.2 x 10.6 inch. The image size is ca. 7.6 x 9.6 inch. Artists and Engravers: Made by 'Franz Hermann Troschel' after 'Ratzeburg, Troschel'. Franz Hermann Troschel (1810-1882) was a German zoologist born in Spandau.